In today’s increasingly difficult commercial environment, demands such as cost reductions and environmental pressures are making business success harder to sustain. 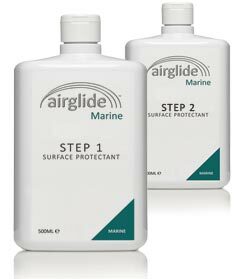 So, if you have a fleet of cars or commercial vehicles, aircraft, wind farms or marine vessels, we believe Airglide can help you. Reduce surface friction by 42%, in the air, on the road or through the water; helping you reduce fuel consumption or increase operational efficiency. Eliminates ‘debris build up’ on external surfaces – including contaminants from ice and dirt to sea water – again increasing efficiency. Optimise enviromentally no waste products – dry clean application. Protect external and internal surfaces; increasing working life and return on your investment, whilst reducing cost of ownership. Cleaner exteriors and interiors; enhancing your livery, brand reputation and service levels. Our unique solution is proven in some of the most challenging applications, for some of the world’s most demanding military organisations. Nano-technology is so much more than an aircraft polish, protective coating or yacht varnish. Quite simply, it is a high performance competitive advantage for your business. The ‘nano-technology’ in Airglide products is a polymer that enables it to cross link and bond with the surface materials – such as paint work, acrylic surfaces, poly-carbon, carbon fibre, bare aluminium and alclad leading edges – to which it is being applied. Airglide products contain hard, durable acrylic particles which create an incredibly smooth finish, which fill the ‘pores’ of the treated surface with a unique resin. This creates a micro barrier to prevent penetration by contaminants such as hydraulic oils, elements and everyday contaminants in the ‘hills and valleys’ of a surface our eyes cannot see. We have a dry chemical clean initial stage that is acid free, unlike our competitors that have an acid based wet wash initial application stage, making us environmentally friendly and there is no contaminated water to drain from site. We can apply to an aircraft quicker than any competitor. The only product in the global market with nano-technology. Totally silicon and Teflon free. Tough, durable and longer lasting than any other treatment, coating, wax or polish. Anti-static, transparent, colour enhancing and spot and detergent resistant. Protects and prolongs the life of a wide range of surfaces, from paint work and livery to bare metal and leading edges such as rotor blades. Eliminates and reduces debris build up, including ice. Inhibits ingress by a wide range of contaminants such as corrosion, dirt & sea water.